Following on from our list of Top 10 Climate Events in the U.S., we have compiled the list below of the biggest climate change impacts of 2017 across the globe. On July 12, after months of anticipation, the Larsen C iceberg separated from the Larsen Ice Shelf in the northwest part of the Weddell Sea in Antarctica. At 2,200 sq miles (5,800 sq km) it is one of the largest icebergs ever recorded, leaving the Larsen C ice shelf at its smallest extent on record and probably since the last interglacial period 115,000 years ago. The calving and potential follow-on long-term retreat of Antarctica’s Larsen C ice shelf extend a southward march of ice shelf breakup down the Antarctic Peninsula toward the South Pole, a progression consistent with the direction of climate change and dramatic warming on the Peninsula since the 1950s. The progression has also been documented along the eastern side of the Antarctic Peninsula, linked to changing winds in the East Antarctic. Satellite images illustrate how Larsen C has receded since the 1980s. The extent of the continent’s fourth-largest ice shelf is now the smallest on record, probably the smallest since the last interglacial period 115,000 years ago. Larsen now straddles the temperature line considered as the practical limit for the viability of ice shelves in the Antarctic. The Arctic has witnessed extremely warm temperatures in 2017, consistent with the long-term trend in which it has warmed at a pace two-to-three times that of the globe for the past 50 years. In 2017, record wintertime heat and a record low wintertime sea ice extent (the third new record in three years) furthered the region’s long-term warming and sea ice decline. In late November, Greenland experienced temperatures as much as 54°F above normal, which raised temperatures above freezing in many locations, converting snowfall to rain and bringing ice melt in a month when the ice sheet is usually adding ice. There has been an increasing number of winter warming events in the Arctic in recent years. Wintertime temperatures are typically below -22°F (-30°C), but in the past three winters, extreme warming events occurred, during which temperatures near or above 0°C lasted over a period of one to three days. Accelerated warming in the Arctic increases global sea-level rise, greenhouse gas emissions, and affects weather patterns in lower latitudes. In early 2017, Chile hit 113°F (45.0°C), breaking its all-time national heat record by 6.1°F. The record heat, along with years of drought, fueled the worst wildfires in the nation’s history. The summer of 2017 featured major heat waves across Europe. In mid-July, temperatures soared above 40°C (104°F) across Spain and Portugal. Spain set a new all-time national heat record on July 13 of 47.3°C (117.1°F). In early August, heat wave “Lucifer” broke numerous records in southeastern countries, including municipal all-time highs in Italy and Croatia. The heat wave, combined with drought, reduced Bosnia’s agricultural output—responsible for one-tenth of the country’s economic output—by nearly 50 percent. The heat also worsened severe drought conditions that plagued Italy since the spring. Italy’s grape harvest started before August 15th for the first time on record. A quick attribution analysis found climate change has made extreme three day heat events like Lucifer four time as likely since 1900. The unusually hot and dry conditions in Europe during the summer of 2017 fueled many, major wildfires in Portugal. The two deadliest events, one in June that killed 64 people and another in October that killed 41, occurred during months that were once considered outside the fire season. A global analysis of daily fire weather trends from 1979 to 2013 shows that fire weather seasons have lengthened across 29.6 million km2—or 25.3 percent—of the Earth’s vegetated surface, resulting in an 18.7 percent increase in global mean fire weather season length. Climate change amplifies the intensity, duration and frequency of extreme heat events. These events occur on multiple time scales, from a single day or week, to months or entire seasons. Climate change also increases wildfire risk by influencing the variables that start and fuel fires. Specifically, warm and dry conditions increase the chances of a fire starting and spreading. 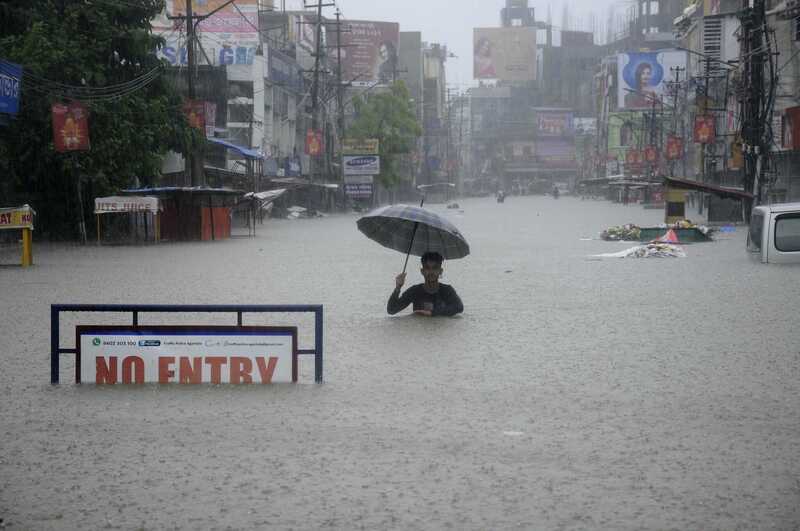 Heavy monsoon rains during the summer of 2017 resulted in unprecedented flooding that killed at least 1,288 people and affected over 45 million in Bangladesh, India, and Nepal. All three countries suffer frequent flooding during the June-September monsoon season, but international aid agencies say the situation in 2017 was worse than usual. The floods of 2017 are consistent with the globally observed rainfall trend that indicates heavy rainfall events are getting heavier (that is, more precipitation is falling now in a given window of time compared to the past).This trend has been firmly attributed to climate change. Trends in central India are consistent with the global trend, according to a paper submitted during the summer of 2017. The study finds rainfall extremes in central India have increased threefold over the last three years and now extend over all of central India, from Gujarat to Odisha. The fingerprint of global warming was found in this event. Increased sea surface temperature bleached and killed corals, while ocean acidification simultaneously made it harder for reefs to recover. In the last three decades, 19 percent of global coral reef area has been lost due to coral bleaching. Global-scale bleaching events were not observed until 1998.